This post is from two years ago. Our family will be celebrating Maundy Thursday this year by using this Holy Week Table Liturgy and washing one another’s feet. She just woke up from her nap. Her cheeks are still warm and rosy red. I rummage around for a basin. The best I can find is the top of a cake carrier. So I fill it up, water as warm as her sweet rosy cheeks. And I’m generous with the soap. I pull up a tiny chair. She sits down and I start telling her that story. The story for the Thursday of Holy Week. The one about the King who bent and washed his friends’ dirty, dusty, grimy feet. Because he loved them. 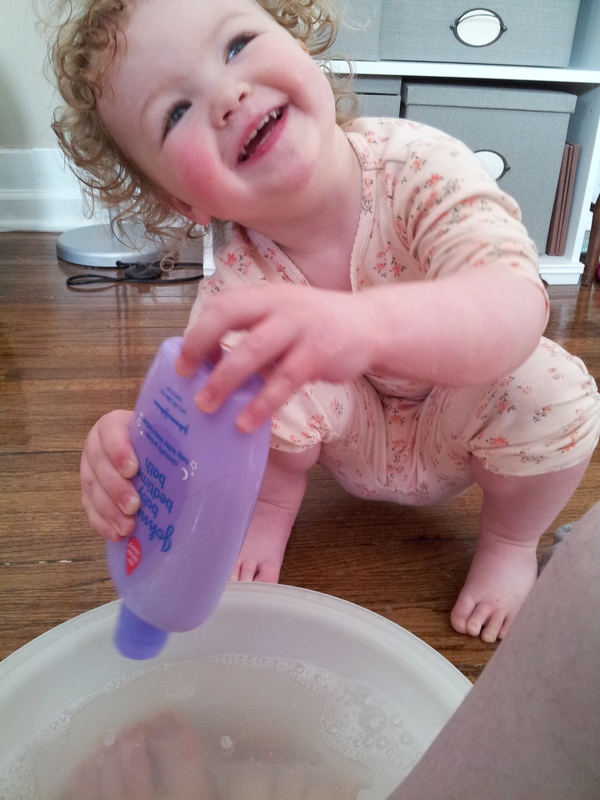 My hands swish in the warm water, soaping, wiping, washing those sweet baby feet. I smile and continue telling her the story, how the King told us to treat one another the way he did. How Jesus came and showed us what it means to really live by giving ourselves away. That I was washing her feet because I love her. 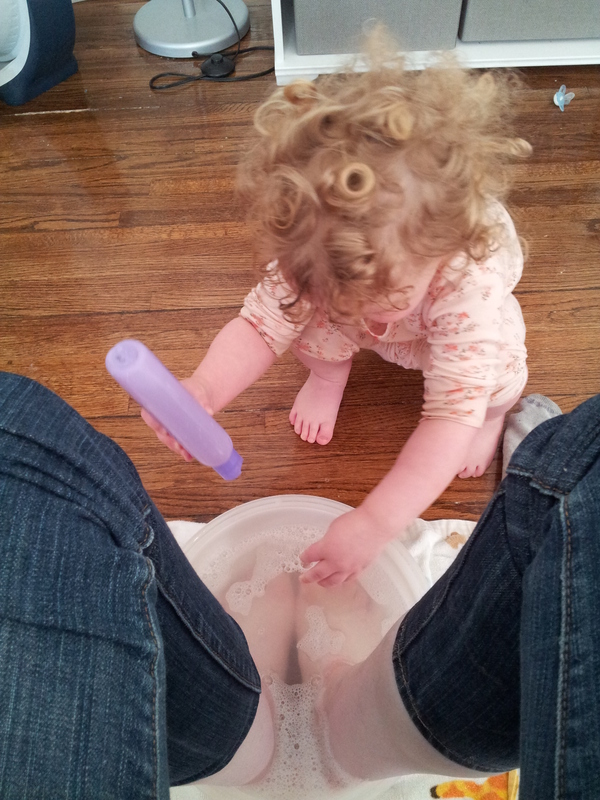 And my sweet girl is washing my feet. And she’s being generous with the soap. And I think about saying something, but I don’t because it’s okay. This is what we are supposed to do– love with abandon. Give ourselves away. Like Jesus. She also makes silly jokes and the way she says that it’s time for the “LAHvender” melts my heart. “I doing this for you, Momma.” When I ask her why, she will tell me that it’s because she wants a turn to use the soap. And the lavender. And I smile, because I know she loves me. And because I know that I can only be faithful to plant little seeds like this and hope that Jesus will do big things. I get my camera, and I snap a few pictures. Because I’m reminded that Jesus doesn’t need us to have perfect reasons for what we do, we don’t have to have everything all figured out before we obey. He just asks us to be like him. To do what he’s doing. To give ourselves away. My idea for doing this activity during Holy Week came from Joanna at Faint Not Mom. Joanna is also a pastor’s wife and a momma to toddlers. I had a lot of fun looking around her blog, and I know you will, too! Sweet, tender story. The love really comes through in the telling. It brought me back to those precious times with my daughter, who is now 25. Darling pictures, too. Good job mom. That’s a beautiful story. Found you on a liebster award nomination. New follower. You are sweet with your words, and I already love your space.